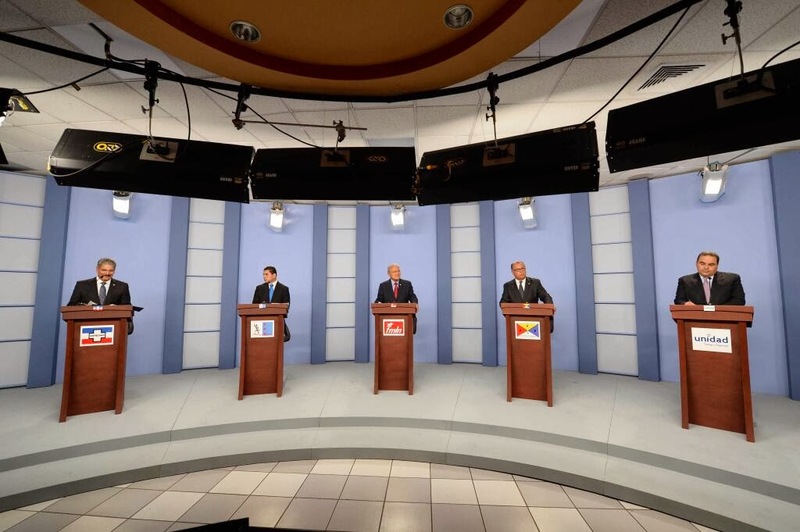 El Salvador held its first ever presidential debate Sunday night, broadcast live over radio and television in the country as well as streaming over the Internet. The debate, sponsored by the association of Salvadoran broadcast media (ASDER) and the Supreme Electoral Tribunal (TSE), was moderated by Mexican journalist Armando Guzmán from Univsion and took place at the Fair and Convention Center (CIFCO) in San Salvador. The three leading presidential candidates Norman Quijano (ARENA), Salvador Sánchez Cerén (FMLN), and Antonio Saca (Unidad), were joined on the stage by two minor candidates, Óscar Lemus (FPS) and René Rodríguez Hurtado (PSP). The debate had four rounds of questions, touching on the topics of education, citizen security, healthcare and the economy. The approaches of the three leading candidates were largely predictable. Current vice president Salvador Sanchez Ceren stressed the policies of the current FMLN government which are popular such as school packets, elimination of the fees for hospital visits in the public hospitals, and the Ciudad Mujer women's empowerment centers. Tony Saca stressed his experience as a former president, promised a future of opportunity with jobs, and emphasized continuing popular programs of his presidency as well as the current government. Norman Quijano focused on traditional ARENA themes -- painting the election as one between liberty and democracy on one hand and socialist authoritarianism on the other hand. Quijano was the least smiling of any of the candidates and spent time in almost every answer attacking the current FMLN government. It was a debate where all the candidates made a lot of promises of what their governments would do. Moderator Guzmán repeatedly asked candidates how they would finance their promises. For the most part the candidates ignored these questions and continued to describe their new programs. Eventually each candidate claimed he would be able to get the economy growing again and that with such economic growth the government could afford its social programs. Norman Quijano asserted that the problem of the national government has not been lack of resources, but the excessive cost of too much bureaucracy. The candidates had varying answers in the area of citizen security. Sanchez Ceren started his response by asserting that El Salvador's police force was "a disaster," and he asserted the police needed to be strengthened with better weapons and training. The former guerrilla commander stated that he was ready to put his experience at the head of the battle for citizen security. His opening answer in this area never even mentioned gangs or the gang truce, until Quijano accused the FMLN government of negotiating deals with the gangs. Ceren denied in rebuttal that deals had been cut. Norman Quijano said his administration would attack the cancer of gangs and extortion with all its energy. Ignoring the constitutional provisions created by the 1992 Peace Accords, Quijano proposed to completely militarize policing against the gangs and said that those arrested would be tried in military, not civilian courts. San Salvador's mayor accused the FMLN administration of creating a sanctuary for gang members. Tony Saca made no reference to his prior administration when dealing with the crime topic, since crime increased almost every year during his administration. But his answer was perhaps the most coherent. Saca acknowledged that the problem of gangs and crime was very important and not easy to fix. While Saca claimed that under his presidency the most dangerous criminals would be sent to jail, he indicated that there was also a need to create opportunity for youth not to join the gangs. The solution to the issue could not be simply oppression he said -- a position which was interesting to hear coming from the author of the Super Mano Dura -- Super Firm Hand -- policies. In the end, I doubt that many minds were changed by this debate, but the fact that the debate took place is yet another step forward for Salvadoran democracy. Tim, why aren't you connected on Facebook and have links to Twitter, etc. ?